Banking reemerged after the fall of Rome in Northern Italy. In the town of Lucca, merchant-bankers set up tables in the square to deal with money from exchange, taking deposits, and lending. 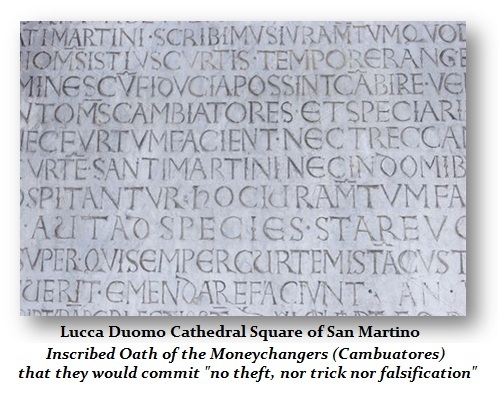 On the wall of the church in the square you will find to this day the oath of the moneychangers – “no theft, nor trick nor falsification.” The industry was born on trust and ethics. 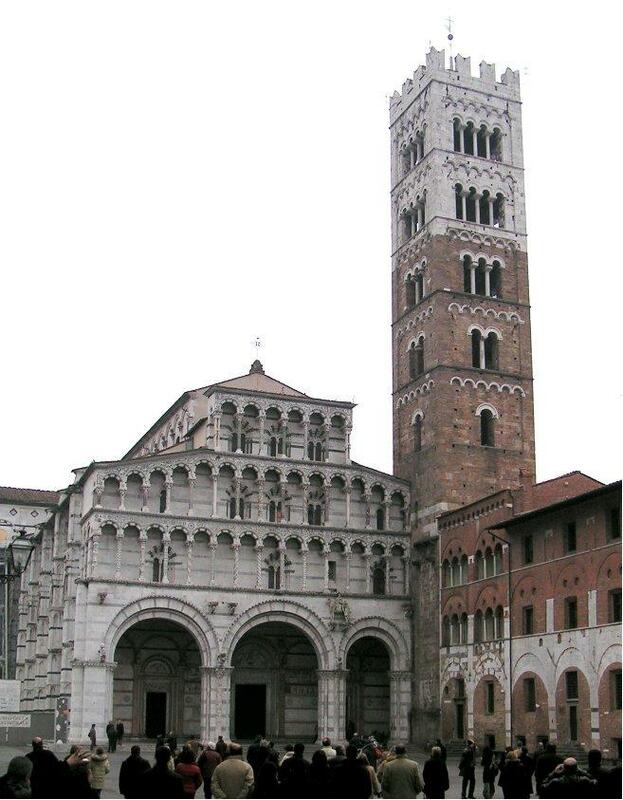 There was the Riccardi, the merchant bankers of Lucca who got caught in a serious liquidity crisis of 1294. 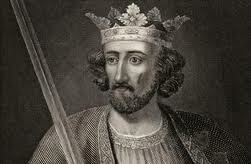 Edward I of England seized the bankers, imprisoned some and in fact defaulted upon all his loans from them. It was Edward I who also expelled all the Jews from England because he had borrowed from them as well and could not repay his debts. He thus expelled the Jews and would not allow them to take their assets thereby confiscating the wealth of the Jews as well. They then fled to Germany for the most part. One must always dig just a bit deeper. The King’s debts owed to the Riccardi have gained attention in most accounts of the events of 1294. However, we also see debts owed to the Riccardi or 5 earls and at least a dozen important men in the administration of the king. The claim was that the Riccardi owed the crown 29,609 pounds, but failed to deduct 18,924 pounds owed them by the king. Using the government profits made from the seizure of their wool alone, the net outstanding amount would be reduced to 3,324 pounds. The debts owed to the Riccardi from the king’s ministers was 6,927 pounds. In this case, The scheme was hatched by Laurence of Ludlow who ironically sailed from England with 227 sacks of wool seized from the Riccardi merchant bankers to be sold on the continent, but the ship was so overloaded to save on shipping, that it sank in the Channel taking Laurence with it to the bottom. 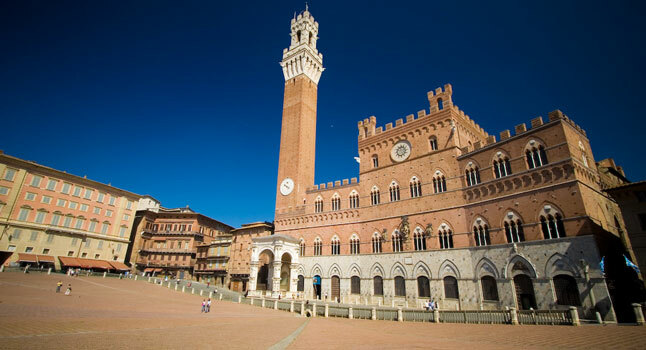 Banking had become a major enterprise in Siena. The first major banker of the era was Orlando the son of Bonsignore di Bernardo, who was a minor merchant. Orlando, together with his brother Bonifazio, expanded the family fortunes and by 1230 he was probably the richest man in Siena. Orlando’s friendship with Pope Innocent IV led to the Bonsignori acting as the first real Papal agents and bankers. In 1255, after Bonifazio’s death, Orlando formed a consortium called the Gran Tavola (“Great Table”), which soon became the most powerful bank in all of Europe. The Gran Tavola became the exclusive banker for the deposits of the income of the Papal States and, under Pope Clement IV, the ecclesiastical tithes for the Holy Land. The Gran Tavola supported Charles of Anjou in his conquest of the Kingdom of Sicily, and benefited greatly from his victory over the Hohenstaufen. Orlando Bonsignori died in 1273. After his death the Gran Tavola soon declined and eventually went bankrupt in the early 14th century. 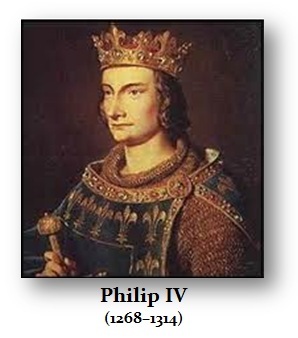 That bankruptcy took place because of the sovereign default of France, when King Philip IV (1268-1314) simply refused to honor his debts. Philip IV seized Gran Tavola merchant bankers of Siena, and the collapse of the Bonsignori, set off a cascade failure that set back banking for some time. The credit crisis of 1294 was monumental. Philip IV did not stop there. The Pope tried to save the funds of the Papacy from the seizure of the Bonsignori operation. This led to the seizure of the Papacy itself and Philip IV then moved the church from Rome to France. He then installed his own French Pope who declared the Knights Templar were violating the laws of God to justify seizing all their banking aspects. He tortured and killed all the Knights Templar he could find.